(Bridgewater, N.J., Oct. 28, 2016) - Somerset Patriots third baseman David Vidal has signed a contract with the Miami Marlins organization. The San Juan, Puerto Rico native enjoyed a memorable 2016 campaign in which he finished second in the league in home runs (26) and hit .320 with 62 RBI despite only playing in 85 games. Vidal was later named to the End-of-the-Season Atlantic League All-Star team thanks to his strong year. In a 12-game stretch from August 5 to August 16, the second-year Patriot hit .340 with seven home runs, 18 RBI and 14 runs scored. Vidal also had two separate stretches over the season in which he scored a run in at least seven-straight games (July 24-31, August 9-17) and a 20-game on-base streak (August 4-24). Vidal began his career with the Somerset Patriots in 2015. That season, he hit .259 with 12 home runs and a team-high 63 RBI. Vidal also led the team in games played (124), at-bats (471) and hits (122) during the regular season. 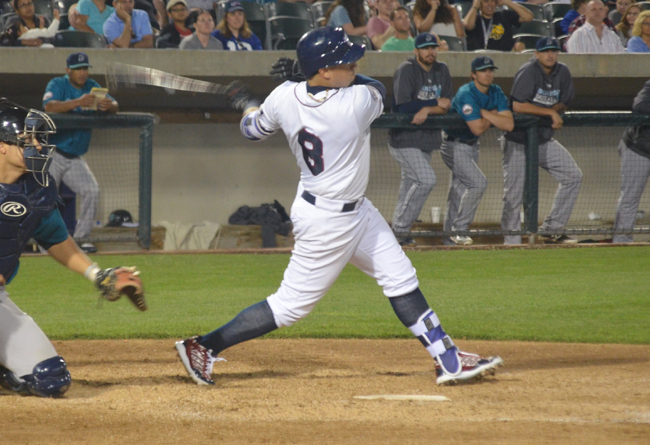 In the postseason, Vidal hit .297 with a home run and seven RBI en route to Somerset’s sixth Atlantic League Championship in franchise history. Vidal hit .283 with 38 home runs, 125 RBI and 45 doubles in 209 games over two years in Somerset. The current Miami resident’s signing with his hometown club marks the second-straight year that the Marlins organization has signed a Somerset Patriot. Last year, Somerset’s everyday shortstop Robert Andino signed with the Marlins during the offseason and hit .267 with 13 home runs over 108 games with Triple-A New Orleans before earning his promotion back to the Major Leagues in early August. Andino then hit .292 over 13 games with the Marlins to finish the 2016 season. Vidal is the fifth member of this year’s Patriots team to join a Major League organization. Starting pitchers Darin Gorski (New York Mets) and Nik Turley (Minnesota Twins) along with relief pitchers Gus Schlosser (Los Angeles Dodgers) and Brandon Sisk (Seattle Mariners) all had their contracts purchased earlier this season.